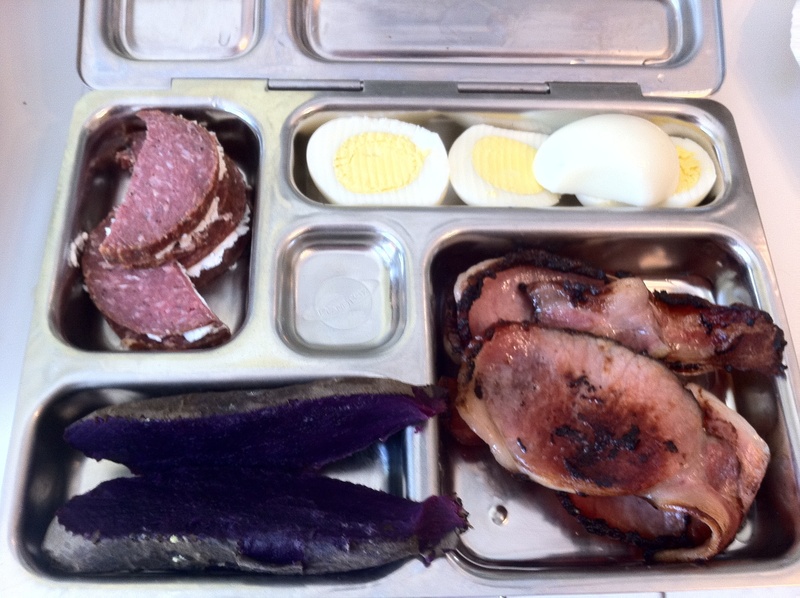 English Bacon & Purple Sweet Potatoes! Purple sweet potatoes are the sweetest, according to the farmer who slipped us a few for free after we bought a few pounds of orange sweet potatoes at the market! Summer Sausage ‘sandwiches’ filled with a goat cheese chèvre spiced with rosemary and basil…YUM! I have learned a lesson over the past 8 months: calories DO count. I think I was over-feeding myself, thinking that because the food is all Paleo/Primal, it wouldn’t cause weigh gain. Well…it has. So I’m reigning the portion sizes in, trying to get my body back to its fat-burning awesomeness!